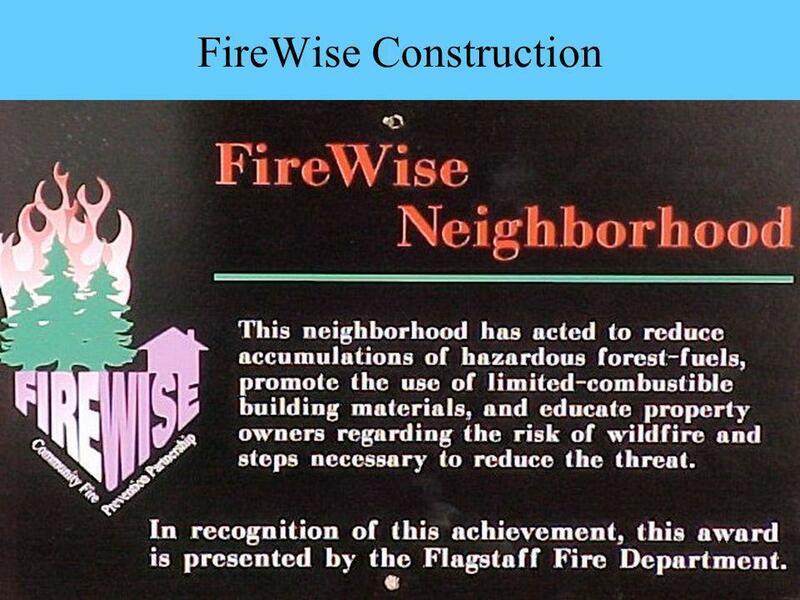 FireWise Construction What Is FireWise Construction Promotes fire resistiveness Required for new construction (in Flagstaff) Found predominately in the. 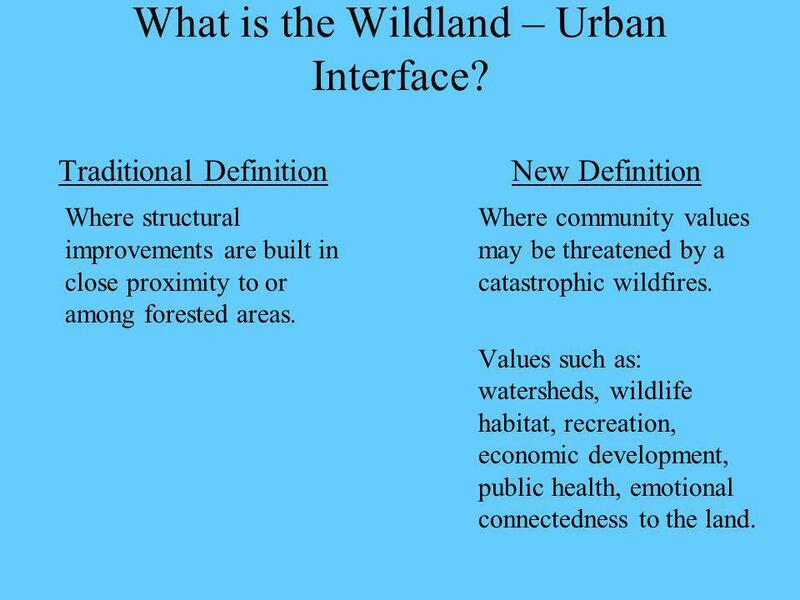 4 What is the Wildland – Urban Interface? 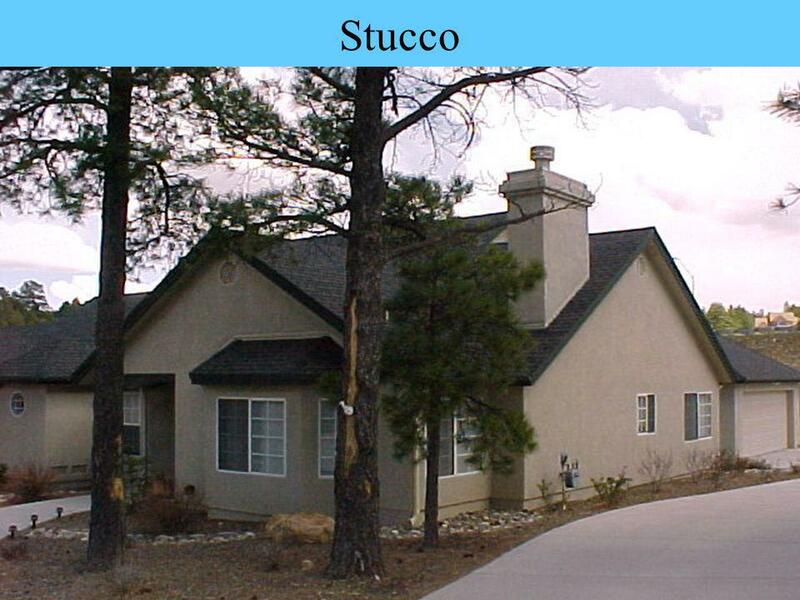 Traditional Definition Where structural improvements are built in close proximity to or among forested areas. 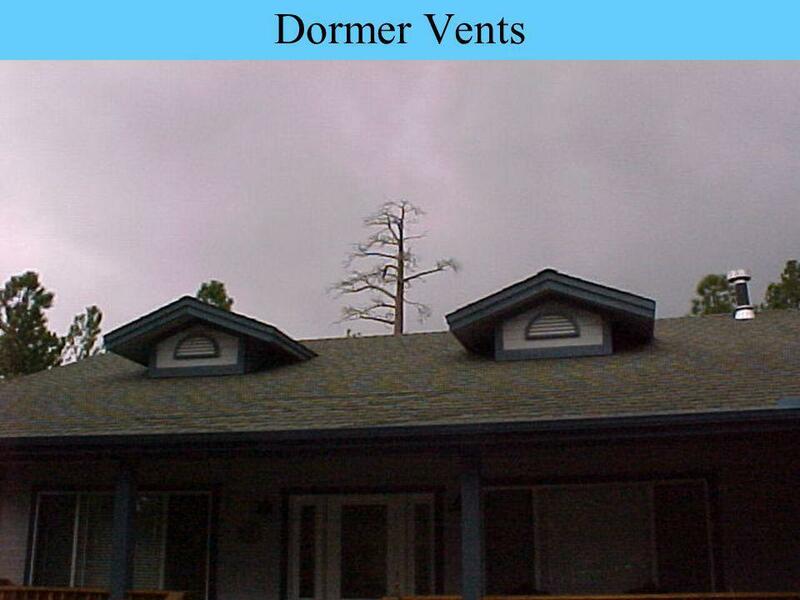 New Definition Where community values may be threatened by a catastrophic wildfires. Values such as: watersheds, wildlife habitat, recreation, economic development, public health, emotional connectedness to the land. 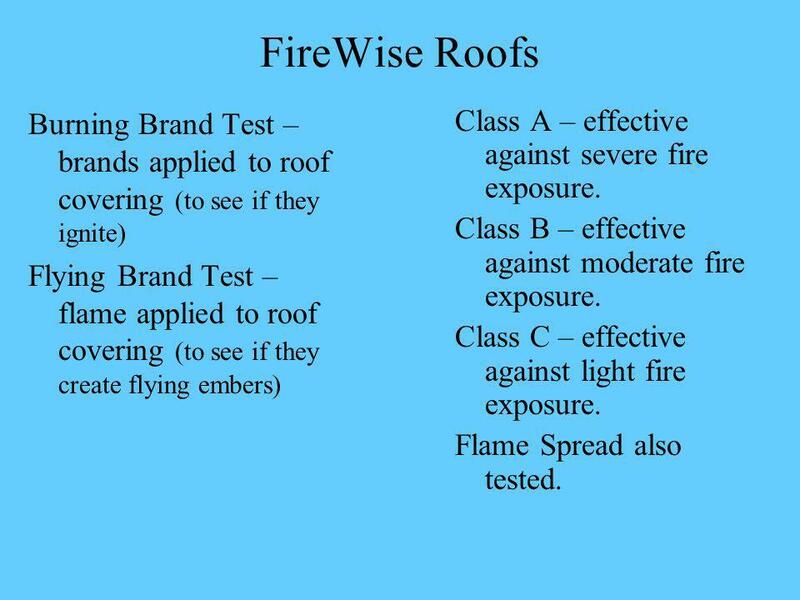 6 FireWise Roofs Burning Brand Test – brands applied to roof covering (to see if they ignite) Flying Brand Test – flame applied to roof covering (to see if they create flying embers) Class A – effective against severe fire exposure. 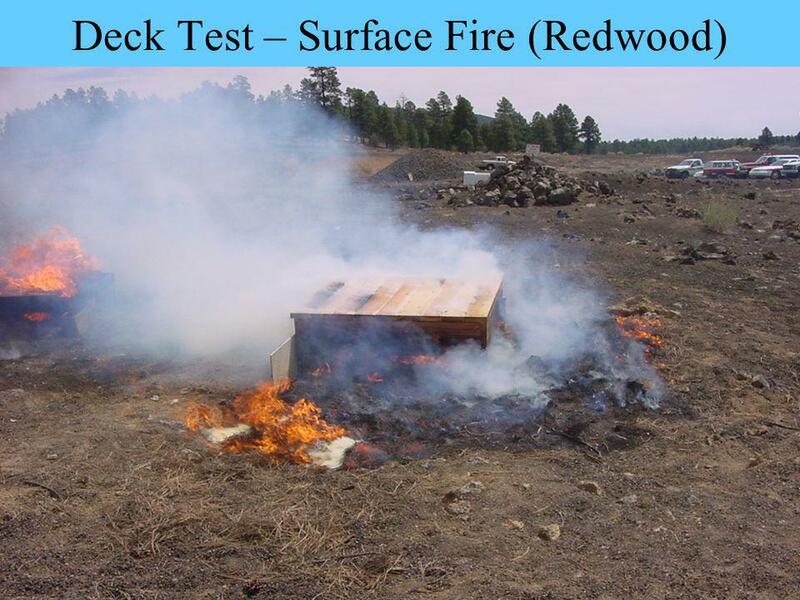 Class B – effective against moderate fire exposure. 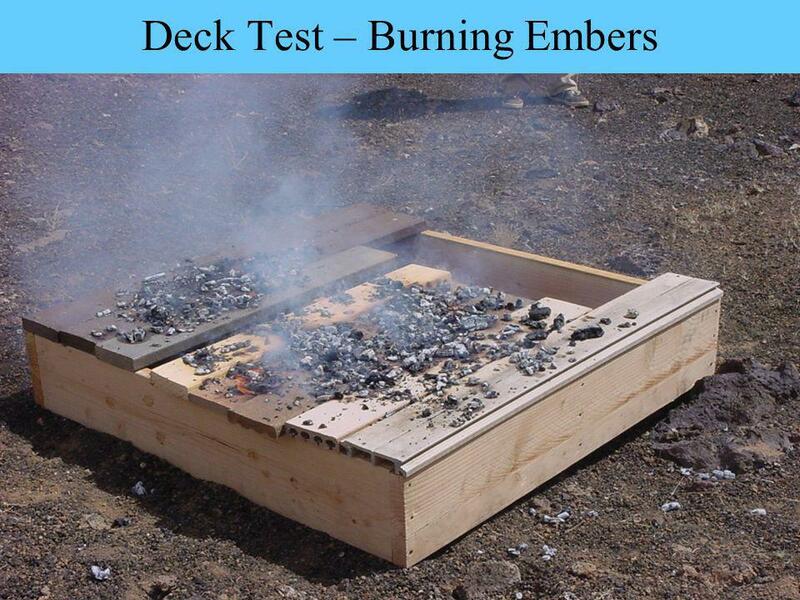 Class C – effective against light fire exposure. 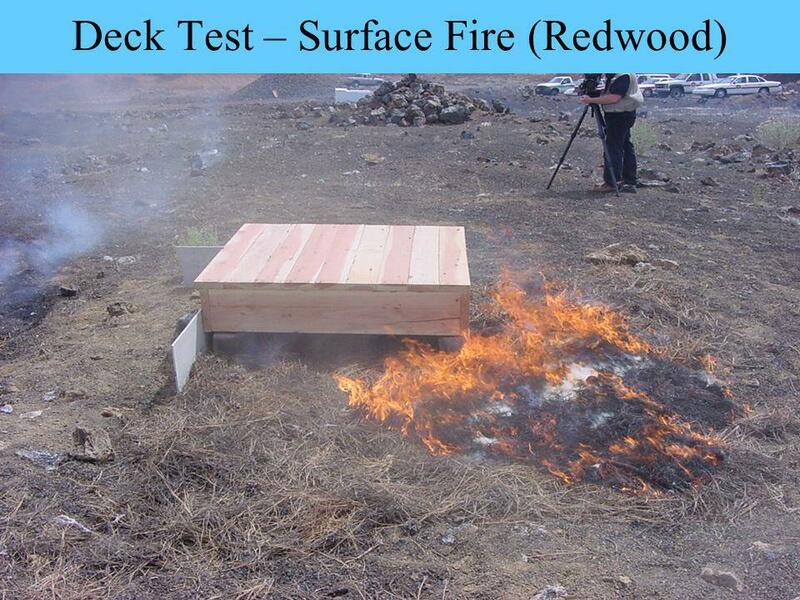 Flame Spread also tested. 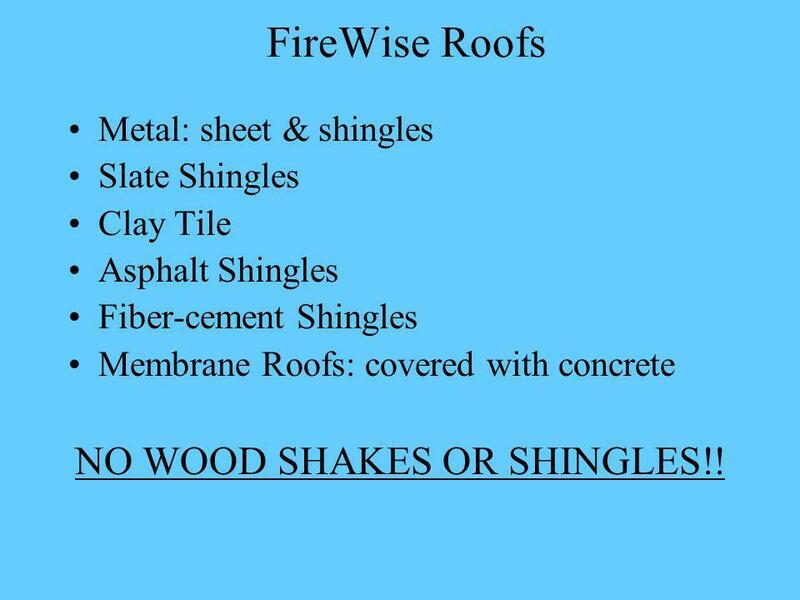 7 FireWise Roofs Metal: sheet & shingles Slate Shingles Clay Tile Asphalt Shingles Fiber-cement Shingles Membrane Roofs: covered with concrete NO WOOD SHAKES OR SHINGLES!! 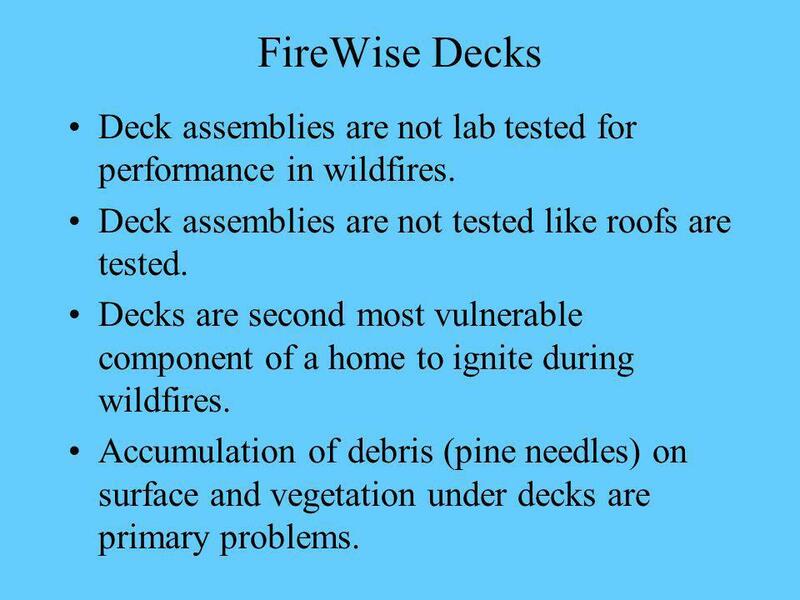 19 FireWise Decks Deck assemblies are not lab tested for performance in wildfires. 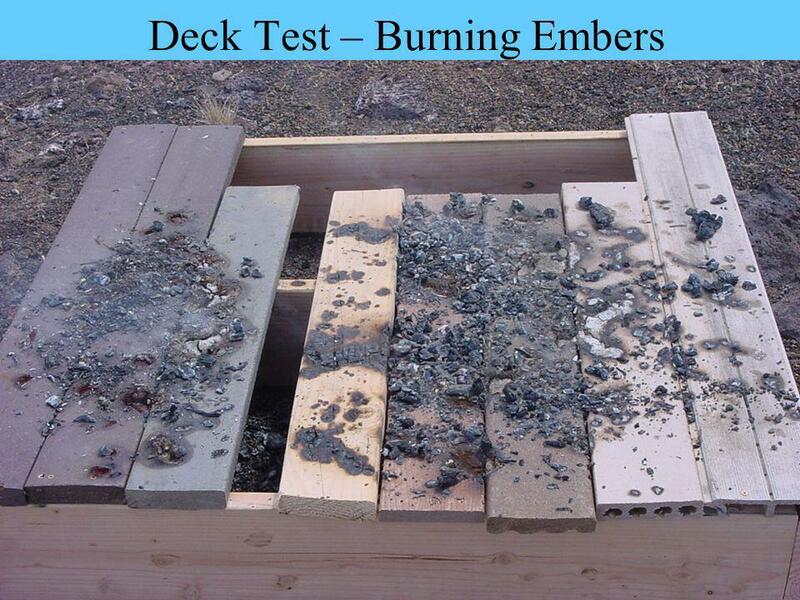 Deck assemblies are not tested like roofs are tested. 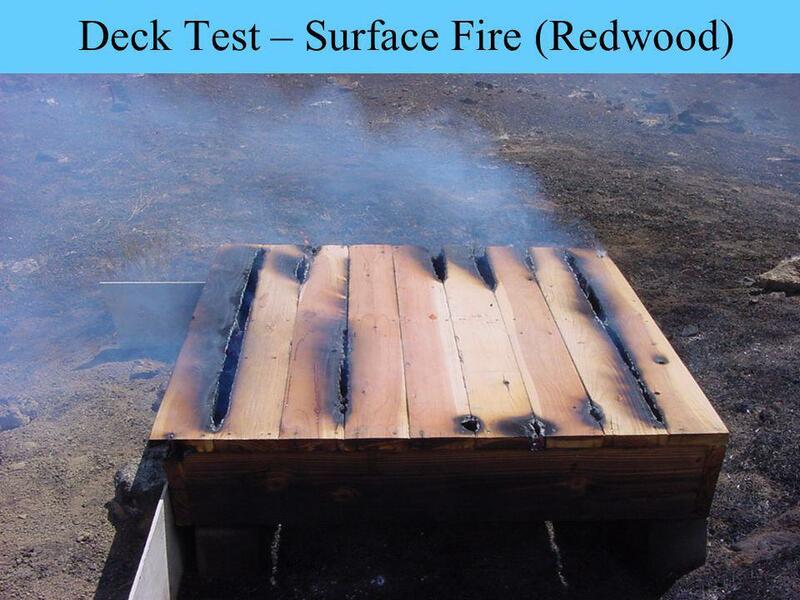 Decks are second most vulnerable component of a home to ignite during wildfires. 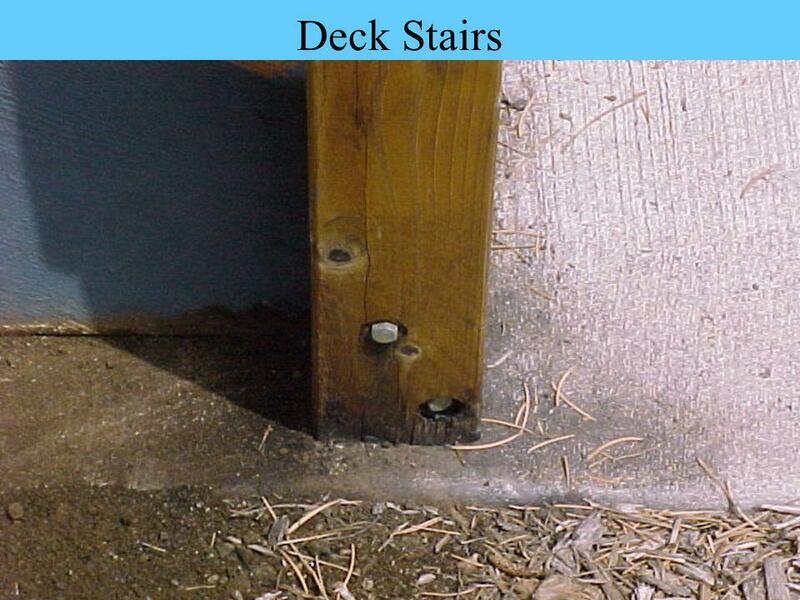 Accumulation of debris (pine needles) on surface and vegetation under decks are primary problems. 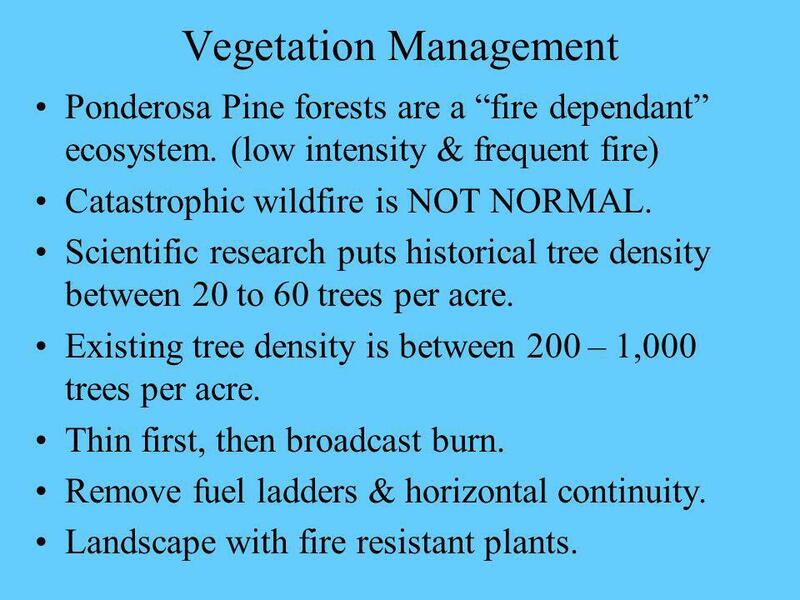 33 Vegetation Management Ponderosa Pine forests are a fire dependant ecosystem. (low intensity & frequent fire) Catastrophic wildfire is NOT NORMAL. Scientific research puts historical tree density between 20 to 60 trees per acre. 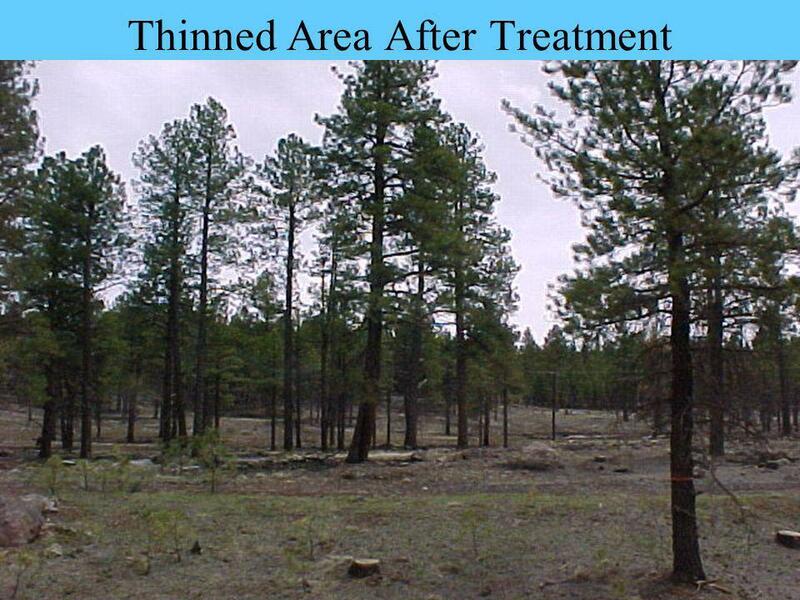 Existing tree density is between 200 – 1,000 trees per acre. Thin first, then broadcast burn. Remove fuel ladders & horizontal continuity. Landscape with fire resistant plants. 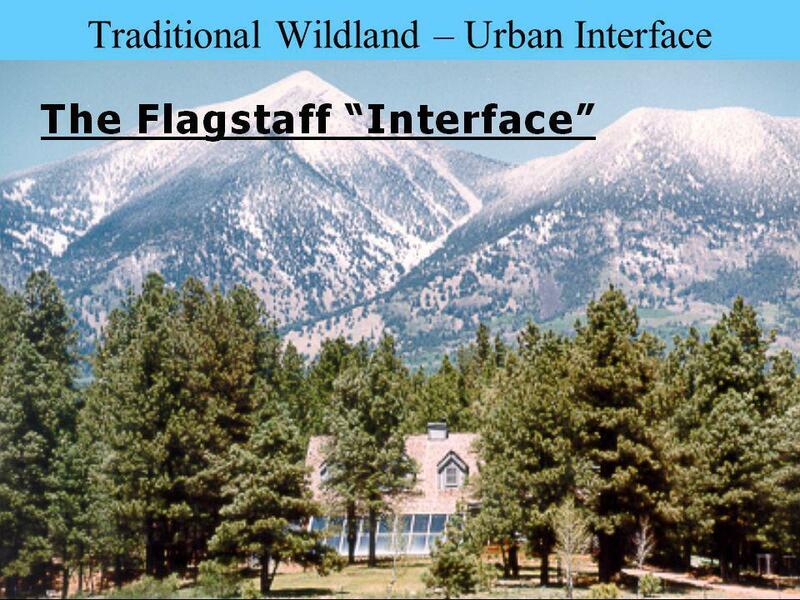 37 Flagstaff Area Practices City of Flagstaff Forest Stewardship required for new subdivisions and building permits in wildland-urban interface. 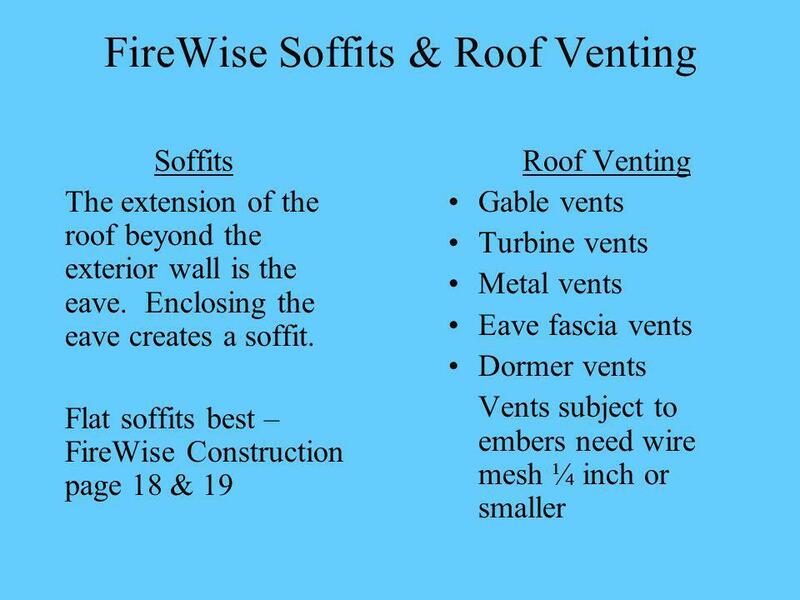 Class A and B roofs required. 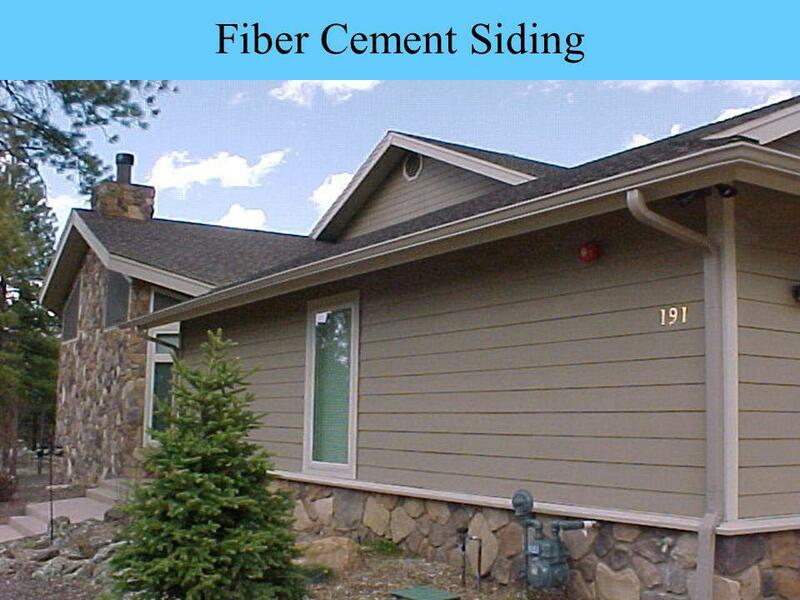 Fire resistive siding required in wildland-urban interface. 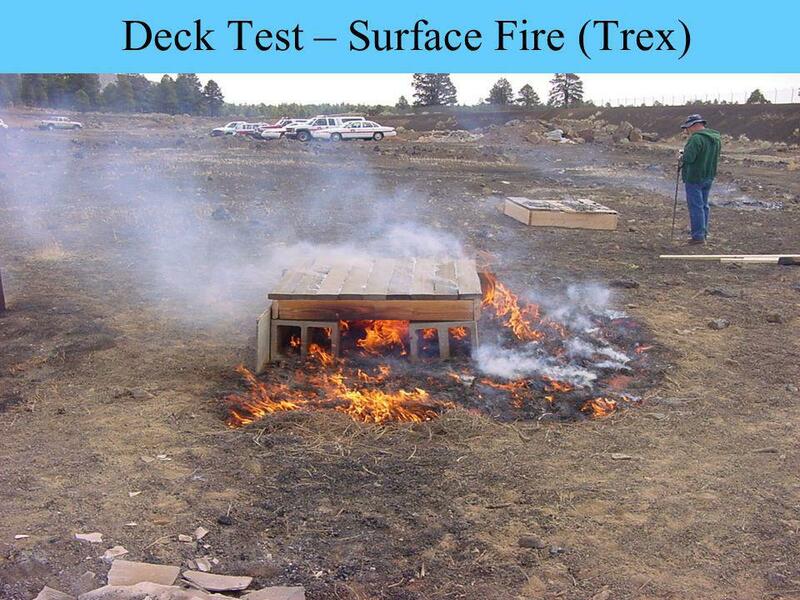 Deck materials limited to wood and Trex in wildland-urban interface. 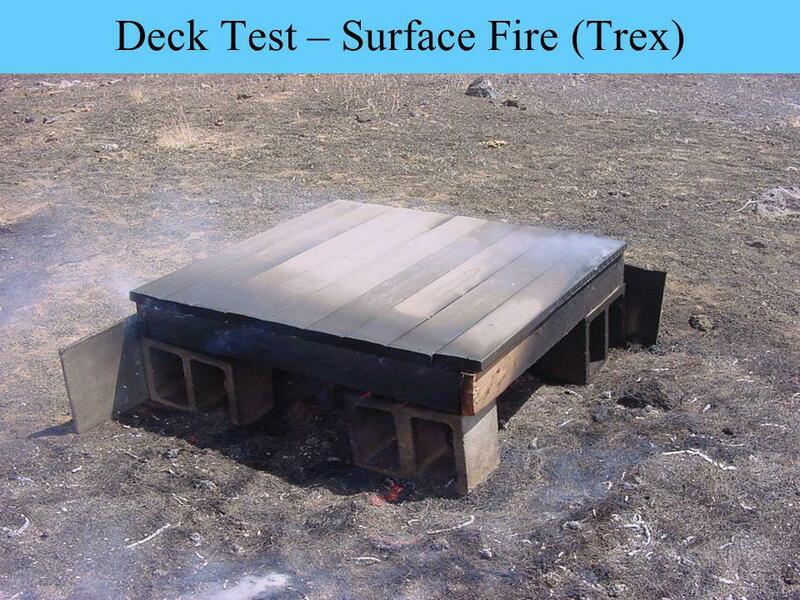 Boardwalk & Geodeck are being tested. 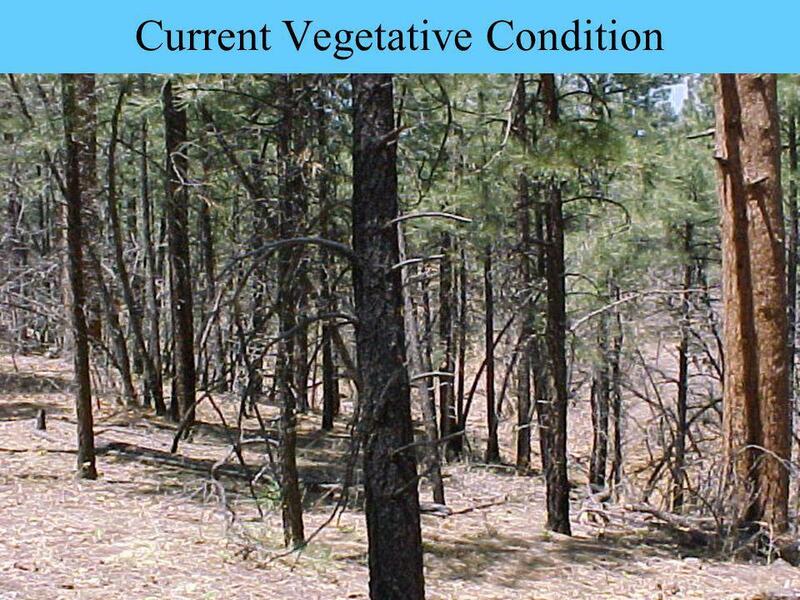 FireWise plant material required in wildland-urban interface. 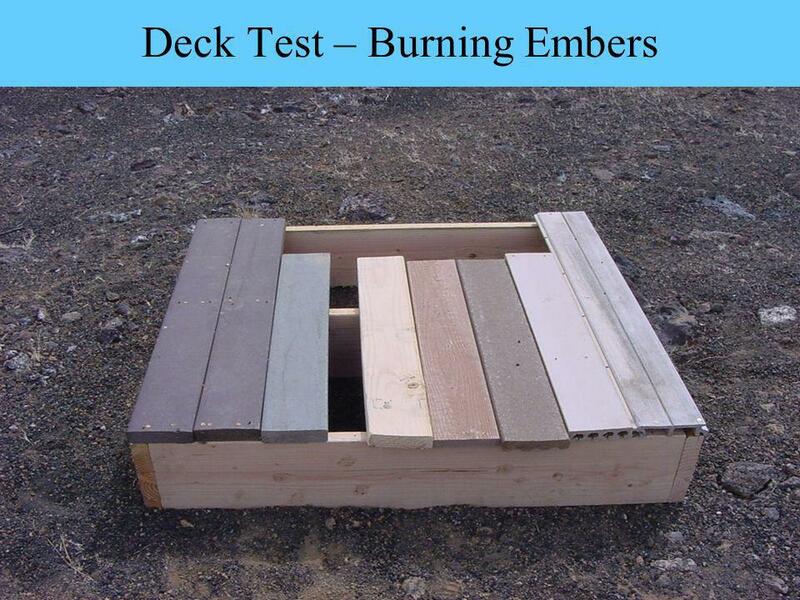 Woodpile locations and deck storage addressed w/education. 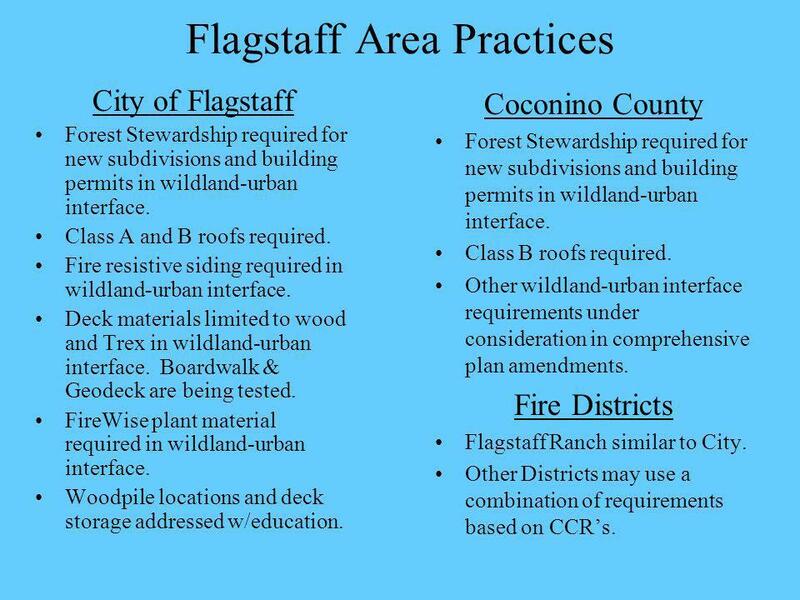 Coconino County Forest Stewardship required for new subdivisions and building permits in wildland-urban interface. Class B roofs required. Other wildland-urban interface requirements under consideration in comprehensive plan amendments. 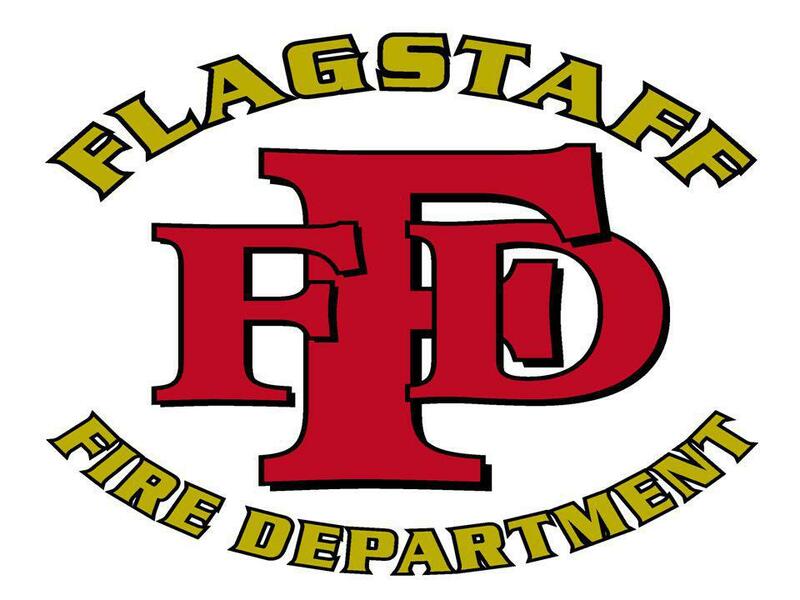 Fire Districts Flagstaff Ranch similar to City. Other Districts may use a combination of requirements based on CCRs. 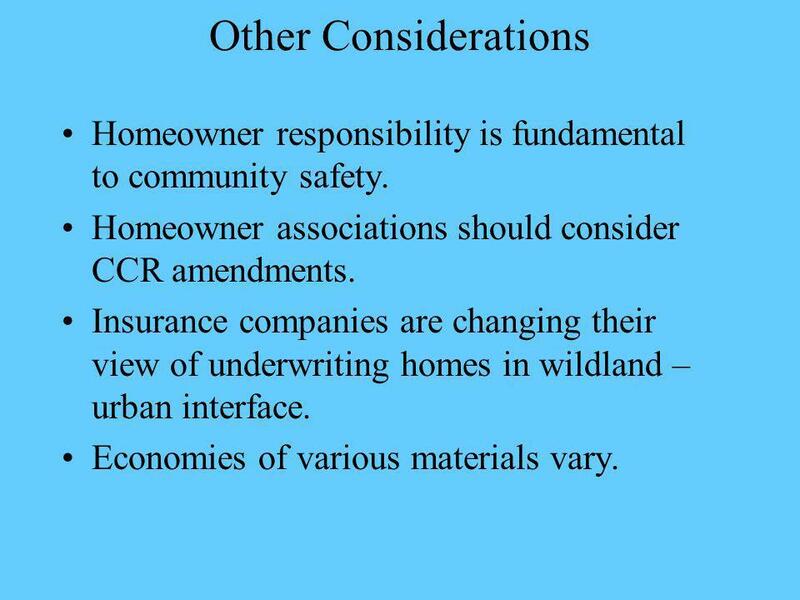 38 Other Considerations Homeowner responsibility is fundamental to community safety. Homeowner associations should consider CCR amendments. 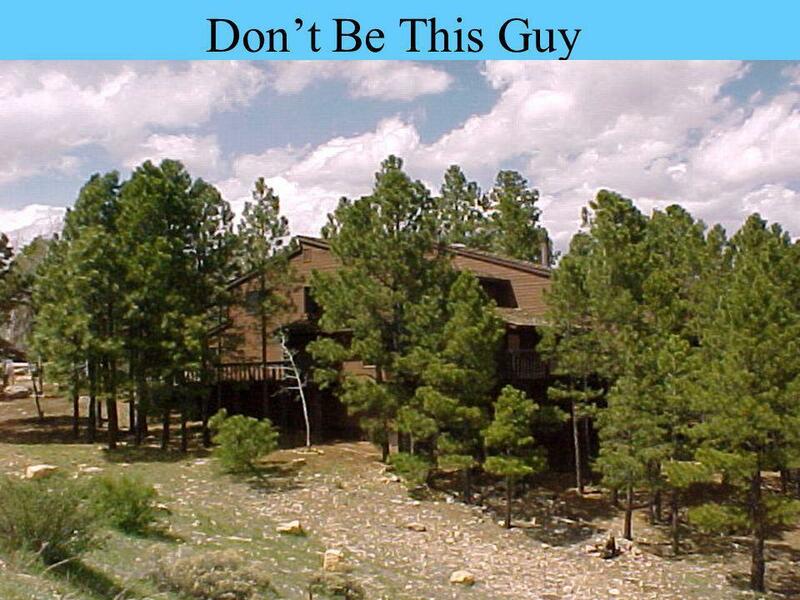 Insurance companies are changing their view of underwriting homes in wildland – urban interface. Economies of various materials vary. 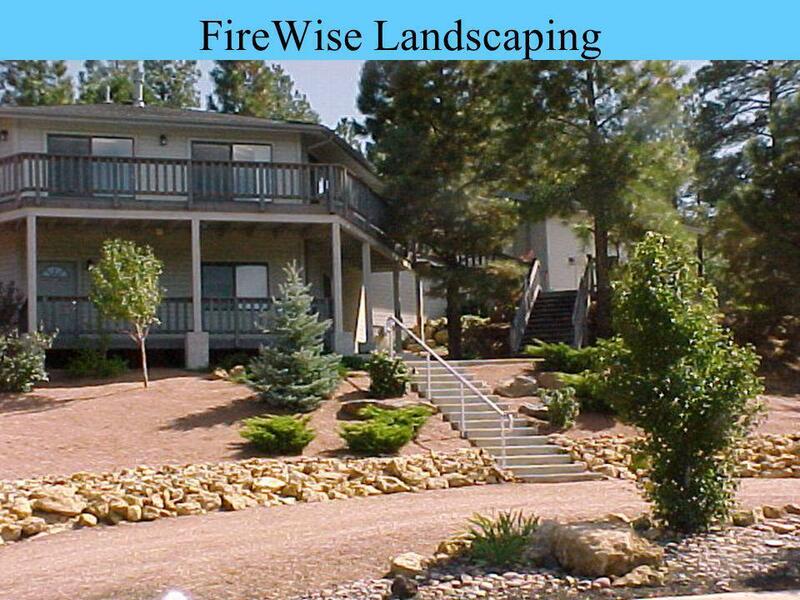 39 Summary FireWise development is affordable and attainable with existing technology. Educating the community is preferred over enforcement, but enforcement may be necessary. 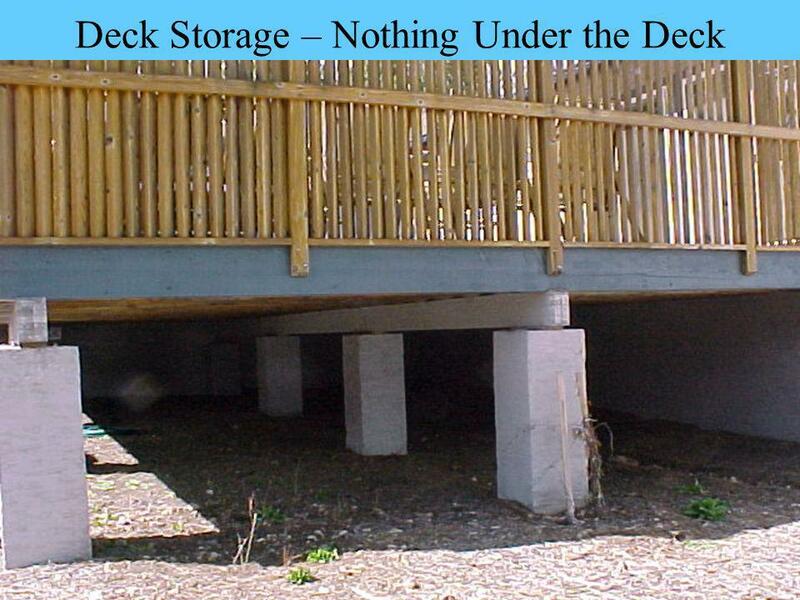 Human behaviors must be addressed (storage under decks, maintenance & woodpiles). 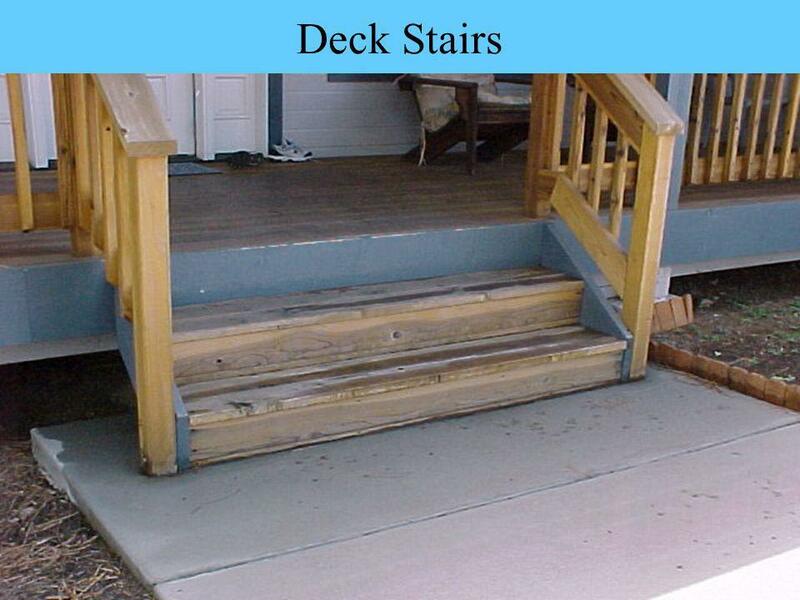 Homeowner responsibility and accountability is key to community safety. 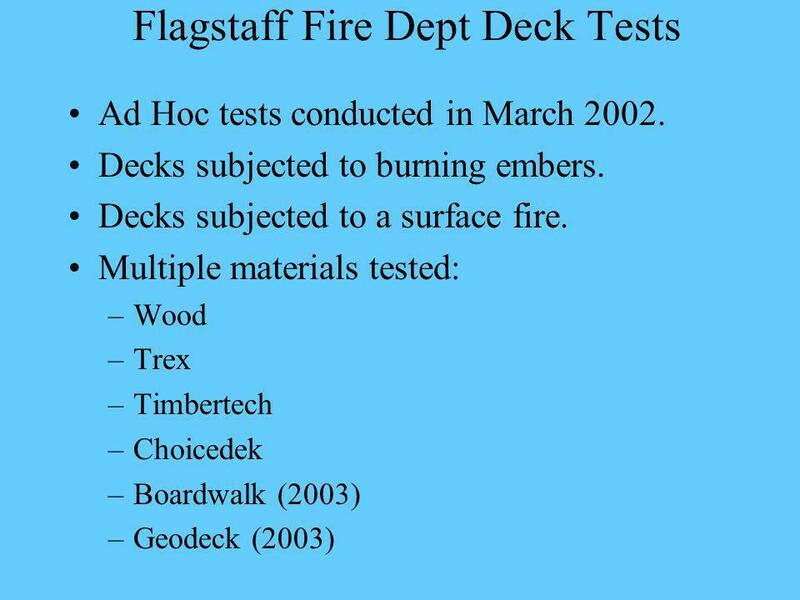 The Flagstaff Fire Dept and others will help. 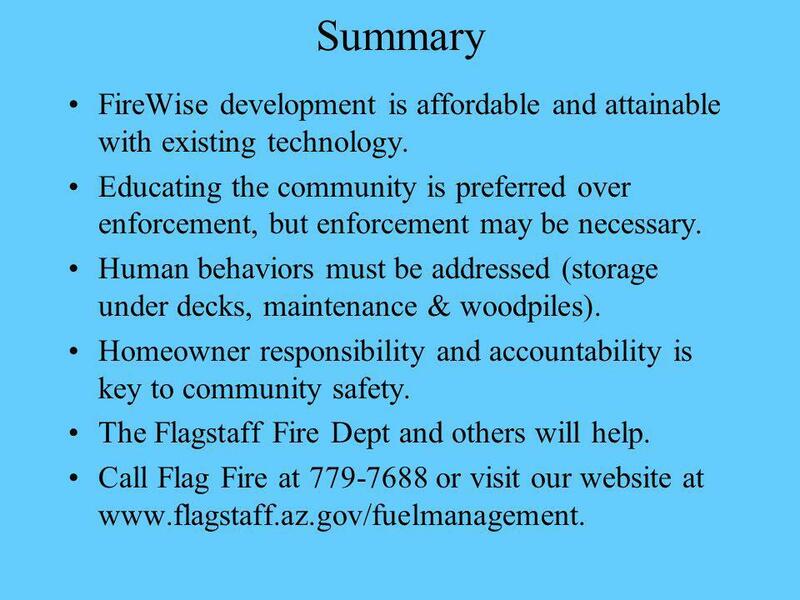 Call Flag Fire at 779-7688 or visit our website at www.flagstaff.az.gov/fuelmanagement. 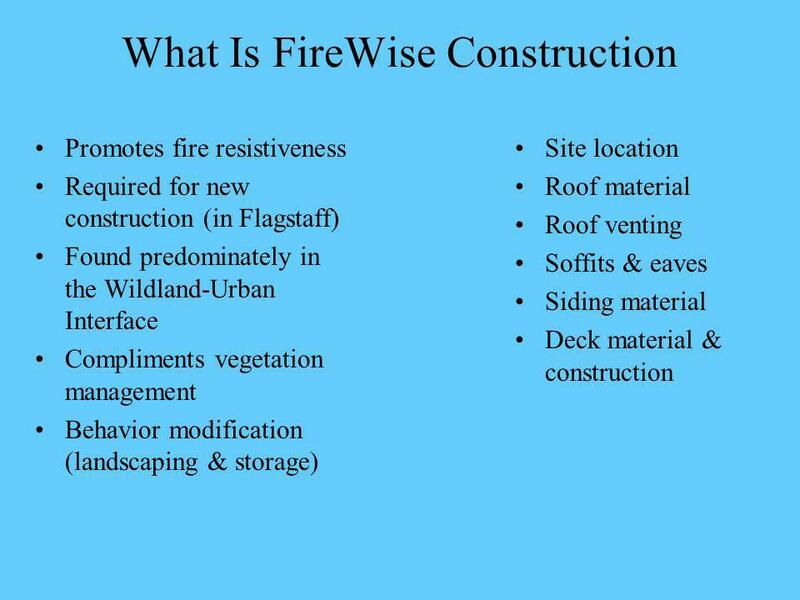 Download ppt "FireWise Construction What Is FireWise Construction Promotes fire resistiveness Required for new construction (in Flagstaff) Found predominately in the." Stewardship Contracting on the Brush Creek/Hayden Ranger District USDA Forest Service Medicine Bow – Routt National Forests and Thunder Basin National. 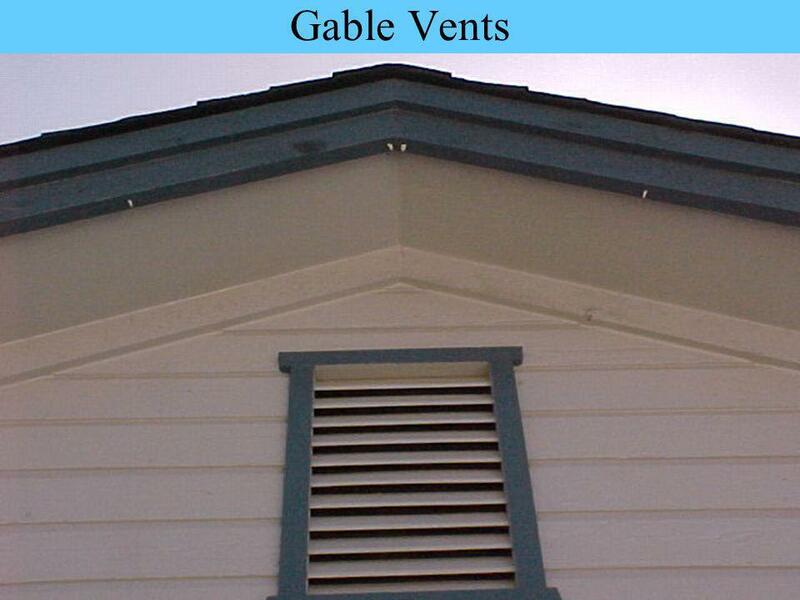 Carpentry Skilled Trades Ceiling and Roof Framing The most commonly used types of residential roof and ceiling construction are: Joist and Rafter. What is a fire adapted community? What is a fire adapted community? 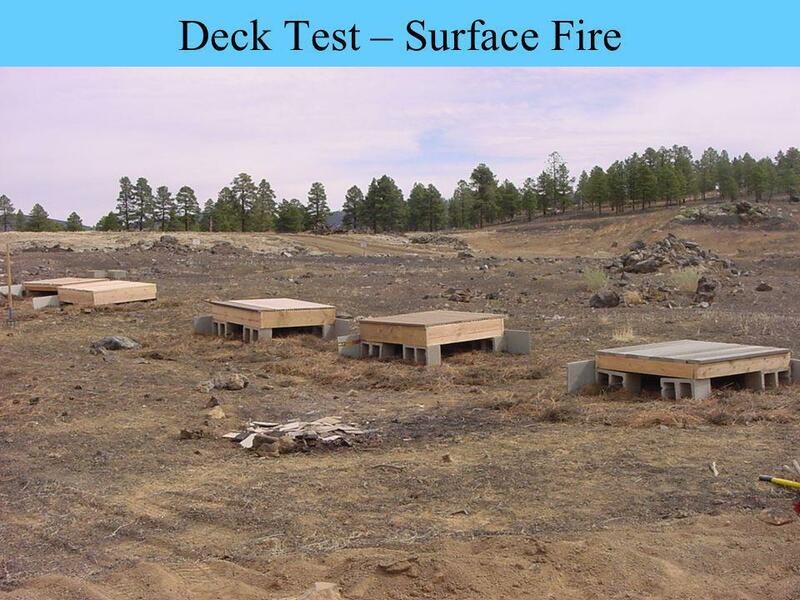 A fire adapted community is one that, through it’s own actions, has mitigated and. 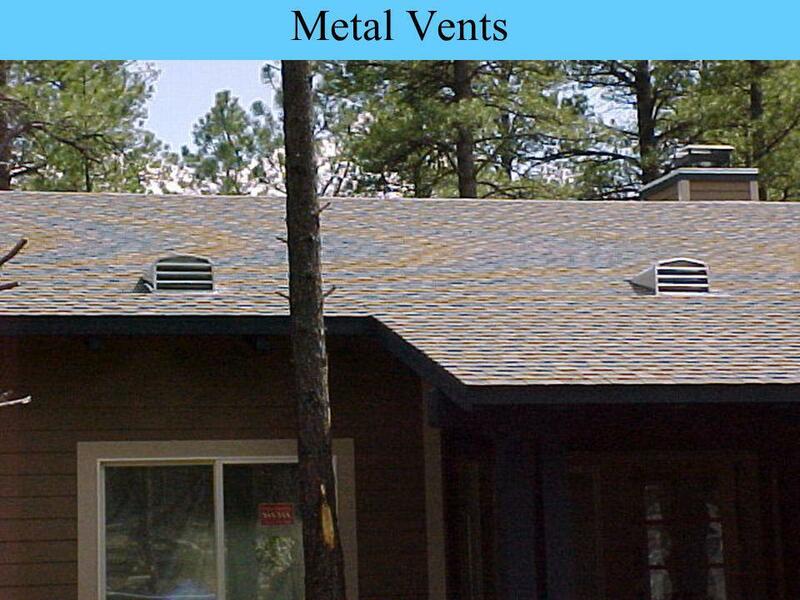 The Structure and Materials of Roofing. Roof structures Although, theorists tried, most roofs until the 20 th century involved a sloping pitch. 40˚ or. Breaking and Breaching. Tools Used Sledge hammers –Long and short handled Chisels Pinch point pry bar –“Crow bar” Hacksaw Handsaw Bolt cutter Flat head. 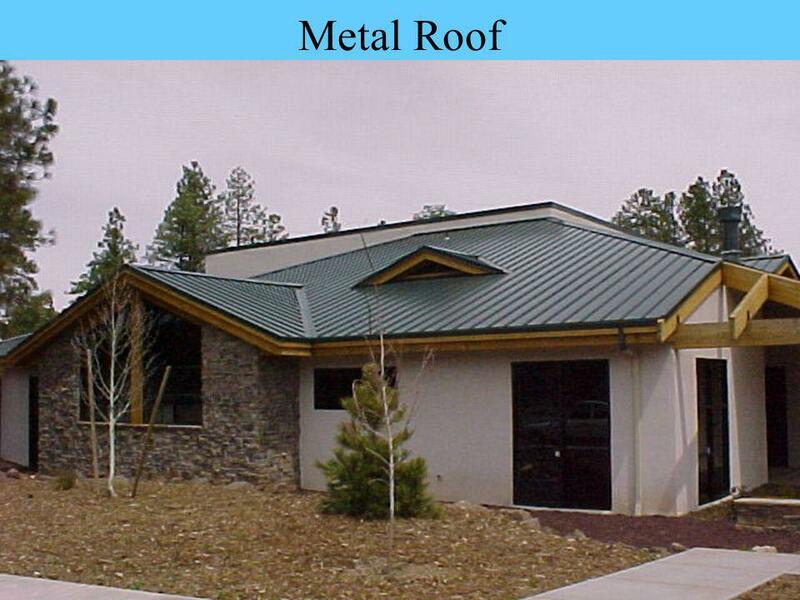 © 2006 ITT Educational Services Inc. CD230 Architectural Design & Drafting: Unit 5 Slide 1 Unit 5 Roofs. Inspecting Roofs Part 2. 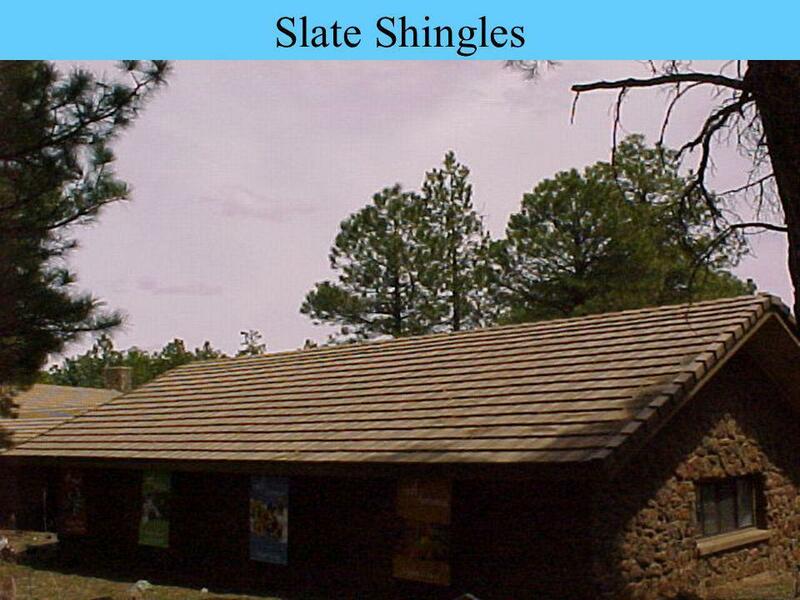 Common Types of Roof shingles Asphalt (composition) shingles Largest market share Low cost & acceptable life span Slate shingles. Juniper Point, Boothbay Harbor, Maine Fire Prevention Overview July 26, 2014. Building and Living in California’s Wildland Urban Interface Presented by CAL FIRE California Department of Forestry and Fire Protection State Fire Marshal. Inspecting Exterior Systems. Over-All Observation While outside, stand back and take a look at the over-all home and site. Is ridgeline straight and level? 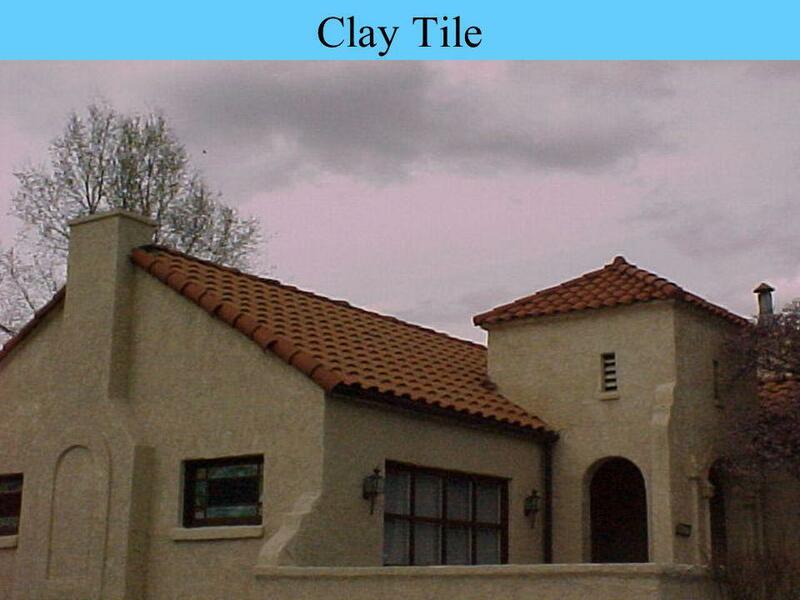 Community Development Department BUILDING ADDITIONS: EXTERIOR FINISHES AND LDC CHAPTER 13 ARCHITECTURAL REQUIREMENTS. 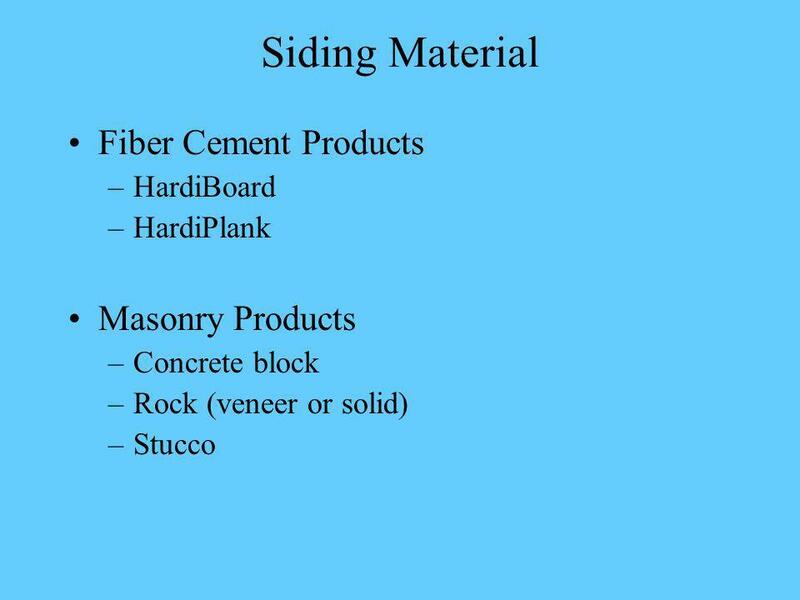 ROOFING MATERIALS. Prepping Materials A roof must be prepped before applying your roofing materials. Step one: Nail on Drip cap. This cap us used to prevent. Chapter 20 Roof Plan Components. Restoring Ecological Health of America’s Forests Wally Covington Regents’ Professor, School of Forestry and Executive Director, Ecological Restoration. Fire in the news. Daily Statisti cs 7/10/02 Year-to-Date Statistics 1/1/02 - 7/10/02 Num ber of New Larg e Fires 3 Num ber of Fires 46,062 Num ber of. Living on the Land Workshop Living on the Land Workshop Bozeman, Montana July 22, 2008 Bozeman, Montana July 22, 2008 Ed Smith Natural Resource Specialist. Carpentry Skilled Trades 2201. 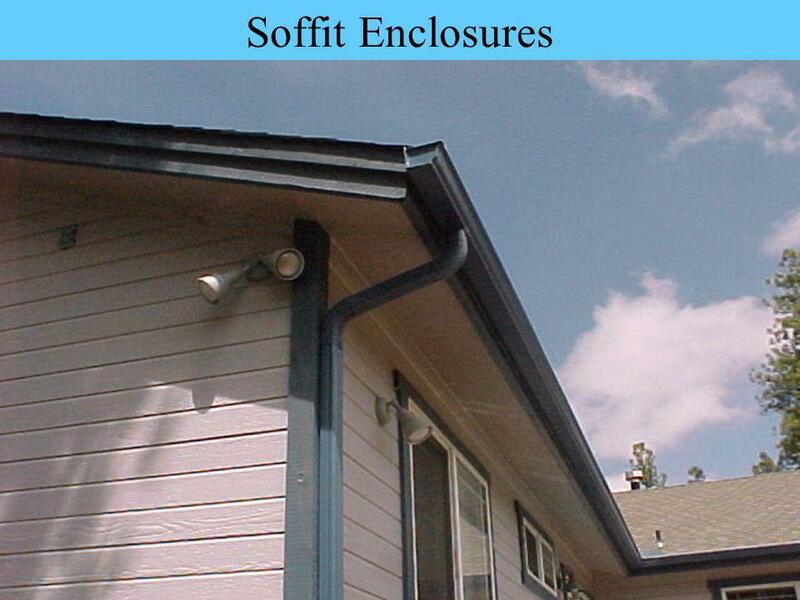 Ceiling and Roof Framing The most commonly used types of residential roof and ceiling construction are: Joist and Rafter.